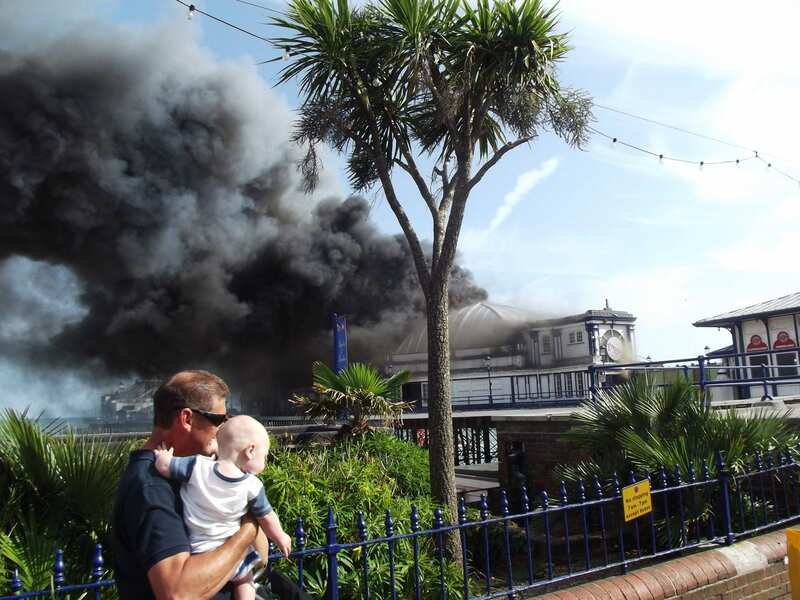 Dramatic photos as Eastbourne’s iconic pier was beginning to catch fire this afternoon. Wednesday 30th July 2014 is the day that the 1871 pier was consumed in flames and black and grey billowing smoke. These photos were taken just before the seafront was completely evacuated. See how, initiall, the smoke became flames, see the terror as the man ran with his baby in his arms. Very few Police at this stage, as they were completely taken by surprise. No evacuation procedure in place, no police training for this eventuality, but good old fashioned common sense prevailed – mostly. Roads blocked, transport disrupted for miles around, fire and emergency vehicles have been drafted in from around the county of Sussex. The wind is coming from the west, blowing flames and smoke along the seafront, not inland, not out to sea, which is a blessing because any other way and houses would be in danger from secondary flames and sparks, and out to see the pier would definitely be destroyed. The history of the pier is a chequered one, with the owners constantly in opposition with Eastbourne Borough Council. If the Council slap a draconian maintenance schedule, then the pier owners, from Blackpool, would have been likely to say, ‘hey, we can’t afford any more money’. The nightclub at the end of the pier at present has a 2am finish licence, they want to make it 4am. Council has said ‘no way’. All academic now.